We hear it all the time … “since I don’t have carpets I guess that means I don’t need to vacuum.” While the thought make sense, it’s actually quite flawed. You know that dustpan line everyone battles with while sweeping? This goes to show that cleaning method only pushes dirt around, opposed to actually removing it. When dirt and debris is left on the floor it can cause premature wear to the finish. As you walk over the floor the abrasive particles are rubbed over the surface and can penetrate the protective coating. This is why non-carpeted floors, like hardwood, stone, tile, and laminate should be vacuumed. 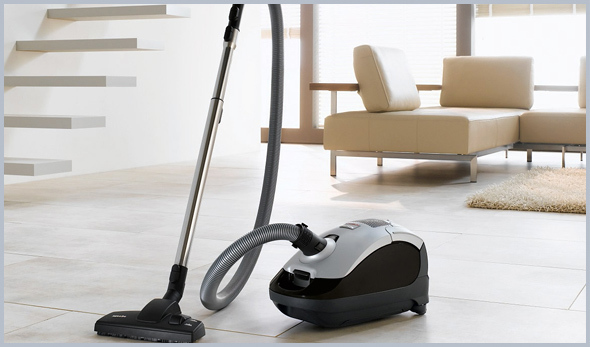 When vacuuming bare floor surfaces ensure the agitator (brush bar) is turned off if using an upright. Or attach the bare floor brush to the end of the hose and wand. A bare floor brush is the most effective option as it allows for the greatest contact with the floor surface and the bristles will gently clean the area. Just because bare floor brushes are the most common attachment for non-carpeted floors, it doesn’t mean they are the only option. In recent years dark floors (like hardwood and tiles) have become popular, and while they can look better in certain applications they have a tendency to show fine dust. In this situation a Dust Mop should be used. Their gentle fibers remove large debris and the coating of fine dust that can be left behind by other tools. Dust the room starting at the highest point. Any debris that was stirred up will fall to the ground to be vacuumed. Start at the farthest point of the room and vacuum all floors. Use a cleaning product like Bona to remove any dried on dirt, and to keep the floors looking their best between vacuums.